May 29, 2017 By Elise Leave a Comment This post may contain affiliate links. Please read my disclosure policy for more info. 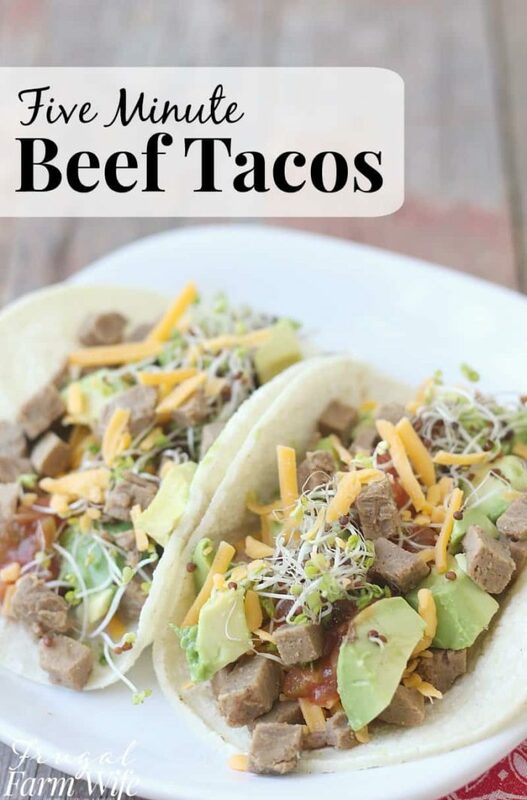 These five minute beef tacos are perfect for those nights when you’re too busy to cook, but still need something thrifty and healthy! What’s the biggest grocery budget buster in the world? Busy nights. You know, those nights when you’re running late, you get too busy, and you order takeout because you just don’t have time to cook dinner from scratch.. as much as I may love pizza. You know that stuff is loaded with junk you shouldn’t eat like sodium, MSG, and other chemical preservatives. To say nothing of the fact that the average takeout dinner for a family of four costs about $25. 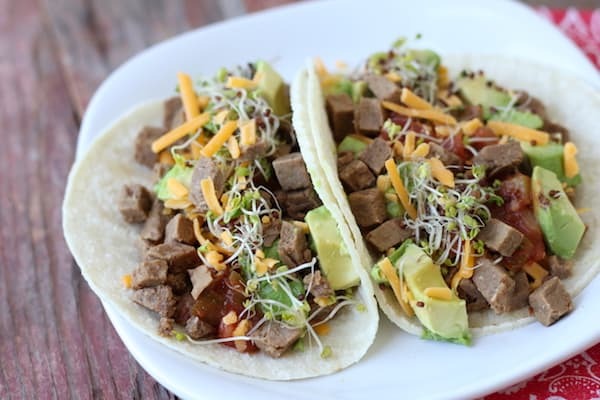 Today, I’m sharing our 5 minute beef taco recipe with you, because it’s both cheaper, AND healthier than any takeout you can get. For me, this recipe comes together in less than the time it takes me to stop by the pizza place on the way home, or order takeout online. I totaled up the seconds from the video footage below – before I sped it up, and cut out the parts where nothing was happening on frame because I was searching for the right bowl and all that, and the total time from start to finish was 4 minutes, 23 seconds. Seriously! Dinner on the table in less than five minutes! Of course, the big secret is the ingredients I used. Refried beans. Normally, I use homemade refried beans. I try to cook a large pot of pinto beans at the beginning of the week, and use them in various recipes all week long. But this week, I ran out, so I ended up breaking into my emergency stash of freeze-dried refried beans, as you’ll see in this video.Obviously, I could have bought canned refried beans from the local grocery store, but I do my best to avoid those, as they tend to be chalk full of lard from confinement-raised pigs (yeah, I’m pretty picky about my lard sources), and depending on the brand, a whole host of other undesirable ingredients.Freeze-dried refried beans on the other hand consist of a single ingredient – beans. So I keep a #10 can in my pantry for what I like to call “first world emergencies”. Total cost for our meal (I show 1/2 cup in the video, but we normally eat about 1 cup) I used in this recipe: $0.98. That’s a WHOLE lot cheaper than takeout! Yes, it’s hard to cough up the cash for a can of freeze-dried beef or chicken at first, but in the long run, it saves you SO much money, and keeps you healthier to boot! Also, in a world where $5 dinners are considered cheap, $7.55 is on the very low side of moderate. So do it! Stock your pantry for a rainy day a busy day, and a day to save money! Enter your email address below, and we'll deliver this short ebook straight to your inbox! I'd like to receive this eBook! Filed Under: Eat Healthy, Main Dishes, Skip The Takeout!